March is Women’s History Month, and today happens to be International Women’s Day. So it seems fitting to pay tribute to one extraordinary woman and writer, Ellis Avery. Sadly, Ellis passed away on February 15, at the young age of 46. In 2002, Ellis received the Ohioana Walter Rumsey Marvin Grant for a writer age 30 or younger who has not yet published a book. 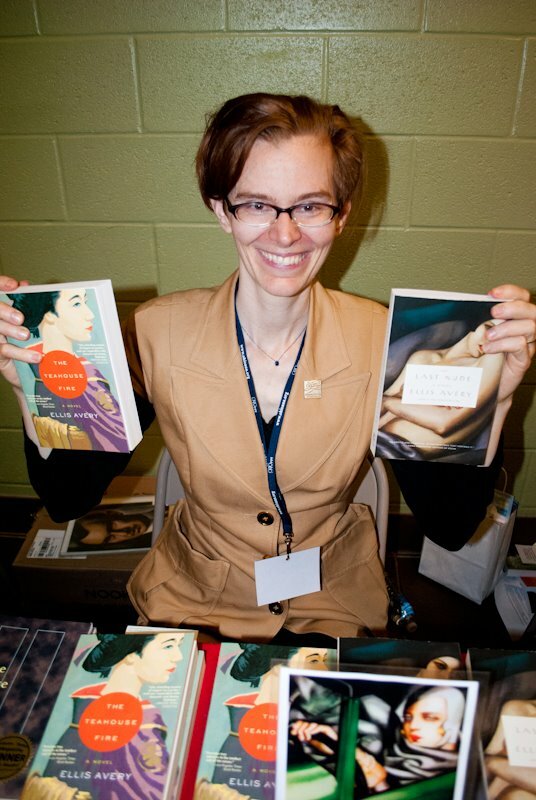 Five years later, she won the Ohioana Book Award in fiction for her debut novel, “The Teahouse Fire.” Ellis and Anthony Doerr are, to date, the only writers to have received both the Marvin Grant and an Ohioana Book Award. Among her other honors, Ellis was also the only author to have won two Lamba Literary Awards. Ohioana Director David Weaver spoke to Ellis in the fall of 2017, interviewing as part of a series of conversations with past Marvin Grant winners. The interview appears here for the first time. How did winning the Marvin Grant impact you: your life, your career, your writing? As it happens, I got the phone call about the Marvin Grant just after I had decided to splurge on a two-week writing class in Assisi, Italy, with literary hero Maxine Hong Kingston, in order to begin what would become my first published novel, THE TEAHOUSE FIRE. The class seemed like a once-in-a-lifetime opportunity, and I had just that morning bitten the bullet, charged it on my credit card, and decided to worry about paying for it later. This was a “Leap, and the net will appear” decision for me: that very day, I received a call from Linda Hengst telling me that I had won the Walter Rumsey Marvin grant! Do you recall how you felt when you learned you had won the grant? Were you able to attend the award ceremony and, if so, what was it like? I was floored and delighted when I received the call. Not only did the grant solve the immediate financial problem of how to pay for the class with Maxine Hong Kingston, it represented some of the first serious professional validation I had ever received. Specifically, it made me take the opportunity to study with Hong Kingston more seriously, and it spurred me both to work all the harder on the novel I began in her class: the financial gamble that the class represented wasn’t just between me and my credit card; it was one that a whole community much larger than myself had chosen to take with me, and I owed it to them, as well as to myself, to take myself seriously. The award ceremony was such a happy occasion! My partner came with me from New York, and my mother, now deceased, flew up from Florida to celebrate with us. It was an honor to be welcomed into the community of Ohio writers in this manner, and, in an unexpected piece of good fortune, I got to reconnect at the ceremony with my beloved elementary school librarian from Columbus School for Girls, Marilyn Parker. What advice do you give young writers when they’re trying to break in? Are prizes such as the Marvin Grant helpful in giving a writer’s career a boost? I encourage young writers trying to break in to be patient and persistent. It’s really difficult to publish a first novel. Subscribe to Poets and Writers and apply for everything you can: prizes like the Marvin Grant can offer financial support, a chance to be exposed to a new and perhaps life-changingly influential audience base, and most significantly, a huge psychological boost: that outside confirmation can help you shift from feeling like a grandiose nobody with a laptop to a true-blue capital-W Writer. Two more pieces of advice: First, bump it with a trumpet. The publishing world seeks quality work, but subject matter matters enormously, too. I could have written a different first novel just as good as The Teahouse Fire but if it hadn’t been about Japan— if the publishing world hadn’t been persuaded that, because of its subject matter, it might be the next Memoirs of a Geisha— it could just as easily have died on the vine. Second, if you have a project that keeps garnering the same feedback over and over— good, but not great, close, but no cigar—it may be a sign that it’s time to exercise the painful courage it takes to put that project in a drawer, start over, and write another, better book. Ohioana is proud of you as not only a Marvin Grant winner but an Ohioana Book Award winner. What does it mean to you to be claimed as “an Ohio writer”? I’m so grateful for the support that the Ohioana Library has shown me over the years, both as a Marvin grantee and as an Ohioana Book Award winner. As for being claimed as an “Ohio writer,” although I left Ohio at age eleven, I have fond memories of Columbus School for Girls and of my childhood neighborhood of German Village. Moreover, it’s an honor to imagine my novels on the same shelf as books by Toni Morrison, Sherwood Anderson, Jacqueline Woodson, etc. But does that give me a sense of what “being an Ohioan” might mean? I’m not sure. I’ve resonated with elements of German Village everywhere I’ve lived—red brick and sycamores, 1880s architecture, the low-tech small-scale pleasures of walking and cycling and being known in one’s local haunts, of exchanging smiles with strangers on the street— but it seems solipsistic to imagine that all Ohio writers have been stamped in the same way: there are as many Ohios as there are Ohioans. In 2007, the year she won the Ohioana Book Award, Ellis sent Ohioana a lovely note and a check for $1,000 – the same amount as she had received five years earlier for the Marvin Grant. She joked that it might not be something she could do every year, but she wanted us to know how much Ohioana’s support meant to her. A wonderful gesture that perfectly summed up Ellis. We’ll always remember her beautiful spirit and writing, through which her legacy will live on.